The XTENDEX® Transparent VGA USB Extender extends four USB devices and a VGA monitor up to 200 feet. 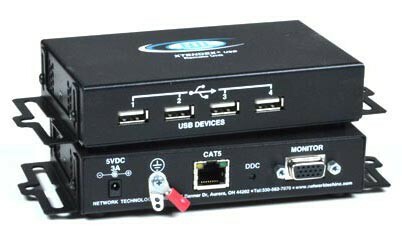 Each USB extender consists of a local unit that connects to a computer and also supplies video to a local monitor, and a remote unit that connects to four USB devices and a monitor. Also known as: CAT5 USB VGA extender, remote keyboard mouse monitor printer usb device, usb extension 150 feet long, kvm balun, VGA CAT5 extender. Supports fully transparent USB connections — supports all USB computers (PC, SUN and MAC) and their associated peripherals. Extend devices such as keyboards, mice, printers, game controllers, USB flash drives, touch screen monitors, whiteboards, etc. Using CAT5e/6 cable, extend USB 1.1/1.0 devices to 180 feet and USB 2.0 devices to 150 feet. Using CAT6a/7 cable, extend USB 1.1/1.0 devices to 200 feet and USB 2.0 devices to 180 feet. DDC2B support for local or remote monitor. Compliant with USB 2.0 (low/full speed) standards. Available options: dual video, dual video + two-way audio (support for speakers and microphone) + RS232. ST-C5USBVT: Transmits signals over one CATx cable. Optional industrial USB extender with VGA video for high temperature environments. This industrial system has the ability to operate in harsh environments at high temperatures up to 158°F (70°C). ST-C5USB2VT: Transmits signals over two CATx cables. ST-C5USB2V2ARST: Transmits signals over two CATx cables. Mounting brackets included for easy surface/wall mounting. Supports USB computers (PC, SUN and MAC) with VGA video. ST-C5USBVT: one male 15-pin HD and one female USB Type B connectors. ST-C5USB2VT: two male 15-pin HD and one female USB Type B connectors. ST-C5USB2V2ARST: two male 15-pin HD, one female USB Type B, two female 3.5 mm stereo, and one female RJ45 EIA-232 serial port connectors. ST-C5USBVT: one female 15-pin HD connector for local VGA monitor. ST-C5USB2VT and ST-C5USB2V2ARST: two female 15-pin HD connectors for local dual VGA monitors. ST-C5USBVT: one female 15-pin HD and four female USB Type A connectors. ST-C5USB2VT: two female 15-pin HD and four female USB Type A connectors. ST-C5USB2V2ARST: two female 15-pin HD, four female USB Type A, two female 3.5 mm stereo, and one female RJ45 EIA-232 serial port connectors. Provides support for full-speed (12 Mbps) or low-speed (1.5 Mbps) USB devices. Compatible with USB touch screen monitors, including HP Compaq L2105tm and Elo 1515L. Video quality adjustment for different lengths of CATx cable is done manually. ST-C5USBVT: one 3.28-foot (1-meter) USB Type A male to USB Type B male, and one 3-foot (0.91-meter) 15-pin HD VGA male to male cables included. ST-C5USB2VT: one 3.28-foot (1-meter) USB Type A male to USB Type B male, and two 3-foot (0.91-meter) 15-pin HD VGA male to male cables included. ST-C5USB2V2ARST: one 3.28-foot (1-meter) USB Type A male to USB Type B male, two 3-foot (0.91-meter) 15-pin HD VGA male to male, two 3-foot (0.91-meter) 3.5mm audio, and one RJ45 EIA-232 serial cables included. Operating and storage relative humidity: 0 to 90% non-condensing RH. Local unit: powered from attached computer via USB. Use NTI's USB adapters to connect non-USB devices to the extender. "The ST-C5USBVT KVM extender was the perfect solution for us to remove our computers from a dirty environment. We also like that we have the option to add additional USB devices." "We are manufacturing a machine that has a touch screen monitor, keyboard, and mouse in a small operator interface enclosure. Then the computer will be located 50 feet away in the main control cabinet. I needed three USB devices and a monitor to go that 50'. Your ST-C5USBVT VGA USB extender fit the need, and is small enough that it fits in the operator enclosure. I've hooked it up and all works well." "I am currently doing a major controls upgrade across our facility, and one of the issues has to do with a Scada upgrade that is not playing nice with our current USB extenders. I have not had time to track the issue, but have instead found the solution by using your new style ST-C5USBVT extender. I have to run a touchscreen, USB barcode reader, keyboard, and mouse as well as the VGA feed so these have been a perfect retrofit for my needs." "Over the last 5 years we have spent more than I care to think about trying to get our application to work. We had been a loyal shop to one of your competitors for years, then we switched to another competitor. None of these companies could do what you did right out of the box with your ST-C5USB2V2ARST USB Extender." "A few months ago we purchased an ST-C5USBVT video USB extender from you. It works perfectly due to its ability to allow full USB transmission, which we need because we are using a touch screen on the remote monitor."